In Gertrude Stein’s version of the Faust legend, Faust invents the light bulb. This production began with the story of Faust as written and performed by two seven year-olds. A full-voiced sampling of arias from Boito’s opera Mephistopheles followed, then Stein’s uncut text performed to an a cappella score created by the cast in rehearsals. All of this was presided over winningly by Glenn Shadix as Miss Stein. 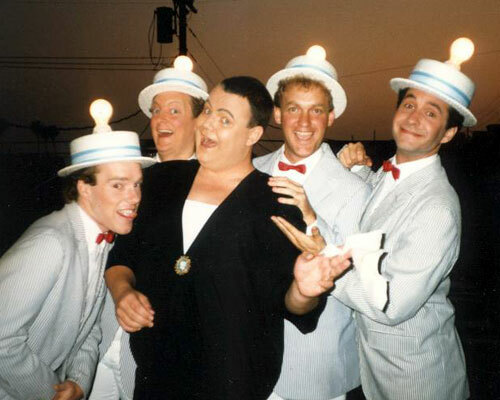 The singing lightbulbs were a particular crowd- pleaser. Here they are warming up backstage. That’s the wonderful singer and Broadway actor Michael Winther with his tongue sticking out.